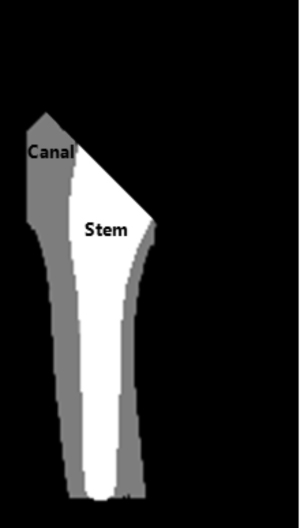 Femur canal fill ratio calculated by regions of canal and stem. A stem loosening is one of the significant problem in the bipolar hip arthroplasty (BHA), causes a pain and instability of a patient’s hip, and requires a further surgery of BHA. A stem canal fill ratio (SCFR), a general evaluation of the stem loosening, have been clinically studied many; however, a determination of the optimal SCFR evaluation has not been still understood well. A purpose of this study is to propose an automatic and quantitative evaluation of SCFR from BHA hip X-ray image. A proposed method segmented the femoral canal and stem, and evaluated SCFR. In experiments, a proposed method’s accuracy was validated, and six BHA patients’ SCFRs were clinically evaluated (age 88±7 (74–93), one male / five females). In result of the proposed method’s accuracy, the femur canal was 90.60±3.65%, and the stem was 97.83±0.46%; therefore, the proposed method had the accuracy to well evaluate SCFR. Result of six BHA patients’ SCFRs was 63.70±5.62%. In conclusion, the proposed method was able to automatically evaluate SCFR from the hip X-ray image with BHA. Y. Uozumi, K. Nagamune, and K. Oe, “Automated Femoral Stem Canal Fill Ratio Evaluation for Bipolar Hip Arthroplasty in 2D X-Ray Image,” J. Adv. Comput. Intell. Intell. Inform., Vol.22, No.3, pp. 333-340, 2018. T. Visuri, T. Lindholm, I. Antti-Poika, and M. Koskenvuo, “The role of overlength of the leg in aseptic loosening after total hip arthroplasty,” Italian J. of Orthopaedics and Traumatology, Vol.19, No.1, pp. 107-111, 1992. J. Dowd, L. Schwendeman, W. Macaulay, J. Doyle, A. Shanbhag, S. Wilson, J. Herndon, and H. Rubash, “Aseptic loosening in uncemented total hip arthroplasty in a canine model,” Clinical Orthopaedics and Related Research, Vol.319, pp. 106-121, 1995. C. G. Mohler, J. J. Callaghan, D. K. Collis, and R. C. Johnston, “Early loosening of the femoral component at the cement-prosthesis interface after total hip replacement,” The J. of Bone & Joint Surgery, Vol.77, No.9, pp. 1315-1322, 1995. E. Morscher and A. Schmassmann, “Failures of total hip arthroplasty and probable incidence of revision surgery in the future,” Archives of Orthopaedic and Traumatic Surgery, Vol.101, No.2, pp. 137-143, 1983. W. H. Harris, “Advanced concepts in total hip replacement,” Slack, 1985. C. Cyteval, M. P. Sarrabère, A. Cottin, C. Assi, L. Morcos, P. Maury, and P. Taourel, “Iliopsoas impingement on the acetabular component: radiologic and computed tomography findings of a rare hip prosthesis complication in eight cases,” J. of Computer Assisted Tomography, Vol.27, No.2, pp. 183-188, 2003. H. J. Cooper, A. P. Jacob, and J. A. Rodriguez, “Distal fixation of proximally coated tapered stems may predispose to a failure of osteointegration,” The J. of Arthroplasty, Vol.26, No.6, pp. 78-83, 2011. L. Dorr and C. Smith, “Clinical results from the calcitite-coated press fit APR hip system,” Dental Clinics of North America, Vol.36, No.1, pp. 239-246, 1992. P. C. Noble, J. W. Alexander, L. J. Lindahl, D. T. Yew, W. M. Granberry, and H. S. Tullos, “The anatomic basis of femoral component design,” Clinical Orthopaedics and Related Research, Vol.235, pp. 148-165, 1988. L. Spotorno and S. Romagnoli, “The CLS uncemented total hip replacement system,” 1991. Y. Yeung, K. Chiu, W. Yau, W. Tang, W. Cheung, and T. Ng, “Assessment of the proximal femoral morphology using plain radiograph-can it predict the bone quality?,” The J. of Arthroplasty, Vol.21, No.4, pp. 508-513, 2006. R. Brunelli, “Front Matter,” Wiley Online Library, 2009. M. J. Parker, K. S. Gurusamy, and S. Azegami, “Arthroplasties (with and without bone cement) for proximal femoral fractures in adults,” The Cochrane Library, Vol.16, No.6, 2010. C. K. Boese, B. Buecking, C. Bliemel, S. Ruchholtz, M. Frink, and P. Lechler, “The effect of osteoarthritis on functional outcome following hemiarthroplasty for femoral neck fracture: a prospective observational study,” BMC Musculoskeletal Disorders, Vol.16, No.1, p. 304, 2015. Z. Zhou, F. Yan, W. Sha, L. Wang, and X. Zhang, “Unipolar Versus Bipolar Hemiarthroplasty for Displaced Femoral Neck Fractures in Elderly Patients,” Orthopedics, Vol.38, No.11, p. 697-702, 2015. Y. Zhao, D. Fu, K. Chen, G. Li, Z. Cai, Y. Shi, and X. Yin, “Outcome of hemiarthroplasty and total hip replacement for active elderly patients with displaced femoral neck fractures: a meta-analysis of 8 randomized clinical trials,” Vol.9, No.5, p. e98071, 2014.